MHM Loves the work of Ann Carey. 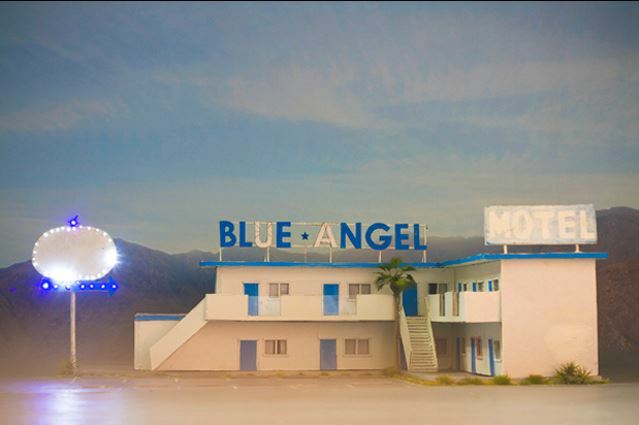 Carey, an artist born and raised on the Gold Coast, makes cardboard models of buildings reminiscent of her childhood, and then photographs them. She focuses on architectural spaces as a medium to open up an imaginative realm for the viewer. Her works continually prompt responses of “This is strangely familiar“, and “We went to a place just like that…” Using ‘memory recall’ as the only reference point of permanence Anna interweaves model making, photography, film and drawing to create fictitious architectural spaces. 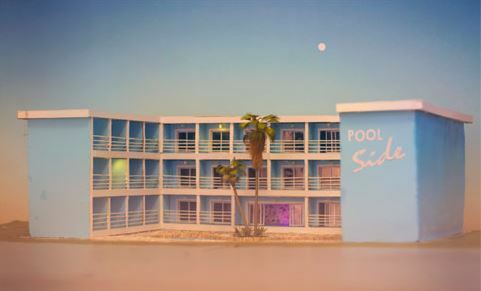 Last year, Carey travelled to the United States to view the classic mid-century modernist architecture of hotels and homes on the boulevards of Los Angeles and Las Vegas, a style referenced in Gold Coast shacks, motels and resorts from the 1950s and 1960s. The inspirations from this trip have added another layer to her body of work. Her current exhibition which is entitled Blue Angel, continues to explore a pre-occupation with the changing urban landscape of cities. These works are much more cinematic in concept and execution. Not only has she hand made the architectural models, this time she has also hand painted the ‘sets’ or ‘backdrops’ which they sit within. “The Gold Coast looked to America for architectural inspiration”, explains Carey. “European houses seem to represent the past and the Gold Coast has always been about the future and the new. When I went to the States, I had all the memories of my childhood coming up. My new works are based on those experiences; the models are combinations of those different places”. Carey has said in the past that in an obscure way her work mirrors what might be seen on a real estate website, or brochure “a somewhat warped reality thrown together through a clever use of photography and a bit of retouching”. There is a sad reality in her works reflecting the fact that these buildings have faded and lost their original glory. They are fine examples of urban decay, deliberately ramshackle but with a certain charm. For more information on the artist’s work, you can visit Anna Carey’s blog or contact Artereal Gallery.